The Mendicity Garrison Relatives Group organised two commemorations on Sunday 22 April 2018. The Fingal Old IRA Commemoration 1916-1921 Society provided a colour party and piper Darragh Bollard played a piper’s lament at the graveside of Peter Wilson and Sean Owens (South Dublin Union) where lilies in memory for each of the garrison were laid on the grave. The Lord Mayor of Dublin, Mícheál Mac Donncha MCC, was in attendance as where relatives of Peter Wilson and Tommy Owens as well as other members of the Garrison, along with Rush Councillor Brian Dennehy Fingal Deputy Mayor and Cllr Darragh Butler. 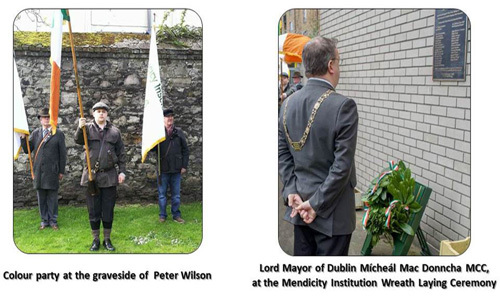 Following this graveside commemoration the group proceeded to the site of the former Mendicity Institution where a wreath was laid by Sr. Paula Peter Coleman, a niece of Captain Richard Coleman, and the Lord Mayor delivered an address. The Proclamation was read by Cathal Boland the Cathaoirleach of the Fingal Old IRA Commemorative Society. The event concluded with the playing of the National Anthem by Darragh Bollard. Click on the relevant link below to download photos of these events.